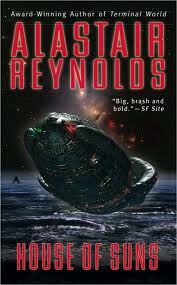 There’s nothing like a good science fiction novel to cleanse the palette after reading too much fantasy. In continuing my quest to read the books that already reside upon my bookshelf, I chose this one from my meager science fiction collection. (I’ll be hunting down more scifi books at the next book sale.) House of Suns was a good choice. Come to think of it, I haven’t read an awful lot of science fiction over the years. Perhaps after watching so many sci-fi TV shows and movies, I never felt the need to read it too. I’ll have to do something about that. The scope of House of Suns, and the sheer vastness of space and time that it occupies has to be my favorite thing about the story. I’ve always been a fan of world building, and often it’s the details that make it good. Just the names of things alone; The Vigillence, The Priors, The Absence, Shatterlings…were enough to grab my attention. The premise of one person cloning themselves into a thousand Shatterlings in order to traverse and explore the galaxy, documenting everything they witness, is an interesting concept. I’ll admit that I was a little skeptical about it at first but it definitely worked. There was a sense of mystery throughout the novel, which kept me reading, since it seems to me that a lot of science fiction that deals with a time so far in the future has a way of feeling like everything has already been figured out with nothing left to puzzle over. If I’m not curious about a book, I’m going to have a hard time finishing it and this sense of mystery kept me coming back to it even if I started to drift. The flashbacks to Abigail Gentian’s past and her interactions with Palatial, really enhanced the story. Her time growing up in the Golden Hour, in a house of mirrors, and the time she spent in a virtual reality fantasy world really added an extra depth to the story, and I always looked forward to those parts. I would have been happy to read an entire novel just about that phase of her life. I agree. I think Sci fi is much more interesting than fantasy.